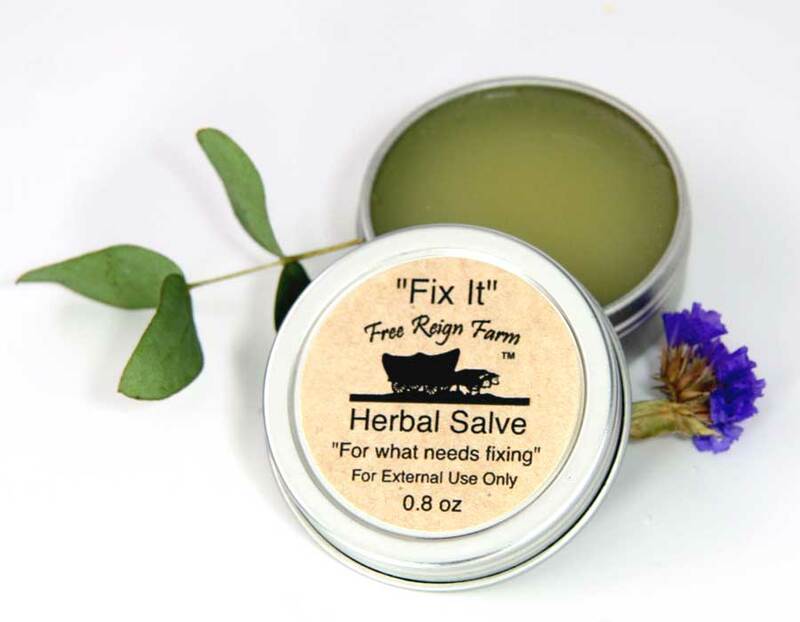 “Fix It” herbal salve is our go-to salve “for what needs fixing” those bites, stings, scrapes and such that are bound to happen around the farm! Fix It is a natural herbal infusion of herbs and essential oils. Fix it comes in a convenient purse-size tin. It’s the kind of thing no mom should ever be without! 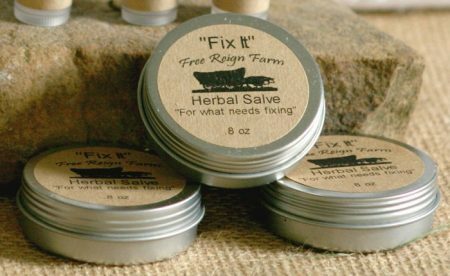 Learn more about Fix It Herbal Salve and many of our other products and stories by visiting our blog. Ingredients: Olive Oil Herbal Infusion (Comfrey, Calendula, Plantain, Yarrow, Rosemary) Beeswax, Vitamin E, Lavender Essential Oil. character, goodness knows there were alot of “characters” who had a hand in making it… just ask Ethel the goat! I’m a seamstress, a gardener, and a homemaker, so I’m forever dealing with the side effects of sharp pins, thorny plants, mosquito bites, and kitchen knives. This salve really does fix all those annoying little nicks and itchy spots. It’s the perfect size to carry in my purse or toss into the medicine drawer. I received second-degree burns on my palms last winter after a bad fall which required Silver Sulfa cream. This worked well, but after a week I used Silver Sulfa in the a.m. and the Fix It Herbal Salve in the p.m. The healing process accelerated; even the doctor was pleasantly surprised. I now keep a tin in my car and one on my bathroom sink and use it on my cuticles, lips and other dry and “flaring” spots. This stuff is awesome!! Great products works on my hands, elbows, and cracked heels.Great for a nighttime rub to go to sleep. I purchased a tin on a whim while in the mountains of southwest Virginia this past summer, put it in my purse and forgot all about it. Recently at work, my shoulders were really achy and sore and I found Fix it in the bottom of my purse, rubbed it on my shoulders and WOW, instant relief! I’m hooked! Just ordered 10 to share with family and friends! 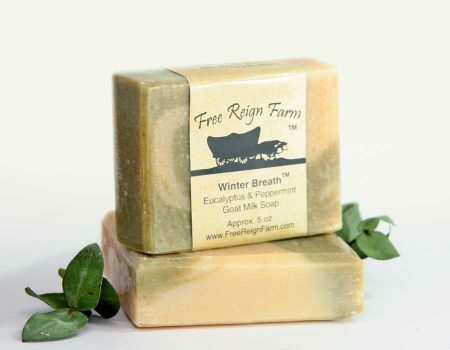 A great natural product. This stuff really does fix it, whatever it is. Bug bites, bee stings, scrapes, rashes, irritations, cuts, raw spots all have been treated with this and each has been controlled and healed. Fix It was used on one of the dogs with a rash. It worked! I have one in my purse and one in each bathroom so that it’s always handy. I received a Natural Living Set for Christmas. I absolutely love everything that was in the box! I have 2 forms of Arthritis, and Fibromyalgia. With a very compromised immune system, even a little scratch can take weeks, or months to heal. I tried the Herbal Salve , and have been so happy with how well it calms the injury, and helps it heal. From rough skin, to bug bites, scrapes, cuts, burns, etc., I and my family have used it dozens of times. Best ever!! We’ve been using this salve for two years for everything from insect bites to rashes to ingrown toe nails. My 10 year old grandson asks for it frequently. My aunt gave me a gift basket with their products. I loved the salve especially and used it on my face to help with the process of healing my acne/scars. I put a little bit on each night after washing my face and it has really helped! 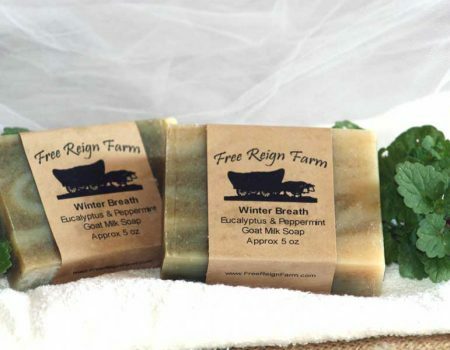 Of all the wonderful Free Reign products, my favorite is the herbal salve. I use it for everything, Wow, a product that helps to heal cuts, scrapes, chapped lips, and dry cuticles is magic. 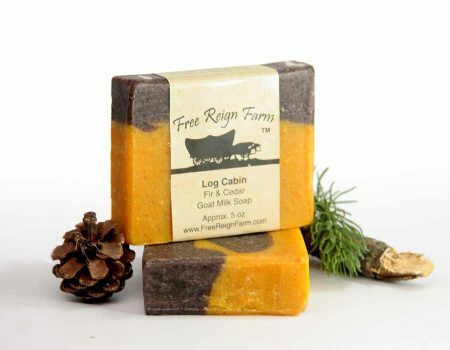 Smells great too! Thanks Free Reign. 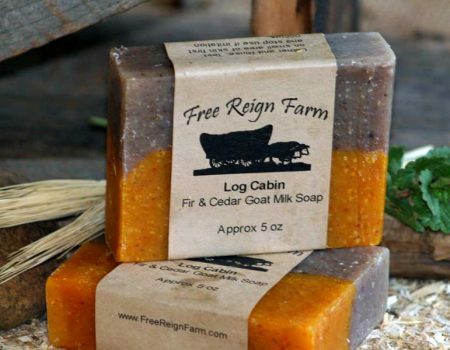 Everything I have purchased from Free Reign has been wonderful! I kept trying to find natural, chemical-free shaving options for my husband and he never liked any of it until he tried these products! Thank you! This is a wonderful product. 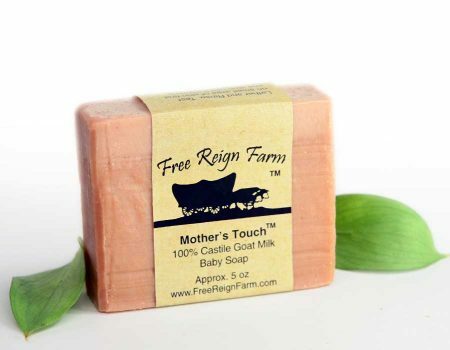 My family can not live without this salve in every bathroom, purse, diaper bag and car. I started to use this salve under my eyes and have noticed a reduction in dark circles, it has really mosturized them as well. Above both my eyebrows I have really dry patches of skin I have been applying the salve on these as well and the dryness is subsiding, I have tried everything and nothing else has work. This is a great product.